Maxwell Coburn Whitmore (June 11, 1913 - October 12, 1988) was an American painter and magazine illustrator known for his Saturday Evening Post covers, and a commercial artist whose work included advertisements for Gallo Wine and other national brands. He additionally became known as a race-car designer. Whitmore was inducted into the Society of Illustrators Hall of Fame in 1978. Coby Whitmore was born in Dayton, Ohio, the son of Maxwell Coburn Whitmore Sr. and Charlotte Bosler, and attended the Dayton Art Institute. Following an apprenticeship with the "Sundblom Circle" of Chicago, Illinois, illustrator Haddon Sundblom, Whitmore moved to New York in 1942 and shortly afterward joined the Charles E. Cooper Studio, on West 57th Street in New York City. There he illustrated for leading magazines of the day and did other commercial art. Whitmore and Jon Whitcomb were two of the top illustrators at Cooper, which in the 1940s and 1950s "monopolized the ladies' magazines like McCall's, Ladies Home Journal, and Good Housekeeping with postwar images of the ideal white American family centered around pretty, middle-class, female consumers living happily in new kitchens, new houses, driving new cars, living with handsome husbands, adorable children, and cute dogs". 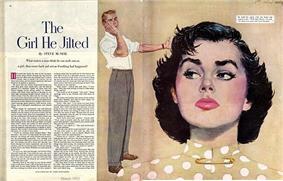 Aside from women's magazines, Whitmore also illustrated for Esquire, The Saturday Evening Post and Sports Illustrated. Additionally, Whitmore, by then living in Briarcliff Manor, New York, teamed with former World War II fighter pilot John Fitch, an imported car dealer in White Plains, New York, to design and race sports cars in the 1950s and 1960s. He and his wife, Virginia, moved Hilton Head, South Carolina, in 1968. He died there in 1988, at age 75. Whitmore's work influenced such comic-book artists as John Buscema, John Romita, Sr., and Phil Noto. Glen Murakami, producer of the 2000s Teen Titans animated series on Cartoon Network, cited Whitmore and fellow illustrator Bob Peak as "big influences on the loose, painterly style we have been using for the backgrounds". His work was presented alongside that of several contemporaries of illustrator Al Parker in the "Re-Imagining the American Woman" section of the retrospective "Ephemeral Beauty: Al Parker and the American Women's Magazine, 1940-1960", mounted by the Norman Rockwell Museum from June 9 to October 28, 2007. Whitmore art is included in the permanent collections of The Pentagon, the United States Air Force Academy, the New Britain Museum of American Art, and Syracuse University. He received awards from the Art Directors Clubs of New York, Philadelphia and Chicago. ^ a b c d e f "Maxwell Coburn Whitmore: 1978 Hall of Fame Inductee". ^ a b M.C. Whitmore, Social Security Number 287-10-5182, at the Social Security Death Index via FamilySearch.org. ^ "M. Coburn Whitmore (1913 - 1988)". Ask Art: The Artists' Bluebook. Archived from the original on June 29, 2011. ^ Pelotas, Geza (n.d.). "The Charles E. Cooper Studio". Atman Art. Archived from the original on July 25, 2010. ^ "The Visual Telling of Stories: Coby Whitmore", Fulltable.com, n.d. Archive of page "Coby Whitmore: Gallery One - Illustrated Fiction", retrieved July 25, 2010. ^ Frank, Michael (2001, n.d.). "The Fitch Whitmore Le Mans Special in Detail". New Jersey Jaguar Touring Club. Archived from the original on July 25, 2010. ^ Blunk, Frank M. (July 8, 1966). "Luxury Sports Car of Tomorrow Is Unveiled Here". ^ "Blackwood Takes Race; Hits 132 M. P.H. in National Modified Sports Car Test". The New York Times. February 22, 1953. p. Section: Sports, p. S7. ^ Spurlock, David J., and John Buscema, John Buscema Sketchbook (Vanguard Productions: Lebanon, N.J. 2001), Hardcover ISBN 1-887591-18-4, signed-numbered hardcover ISBN 1-887591-17-6, trade paperback ISBN 1-887591-19-2, p. 27. ^ Arrant, Chris (November 5, 2008). "Superman/Supergirl: Maelstrom"Phil Noto on . ^ Murakami in Worley, Rob (July 14, 2003). "Teen Titans, LXG, Hulk, Illuminati, X-Men: Comics2Film Wrap". ^ Society of Illustrators Hall of Fame. WebCitation archive. LaRoche Collections: "Coby Whitmore Original Illustrations (circa early '1940s - late '60s)". WebCitation archive.